David Brin attempts to tackle the question, “What would humanity do when they encounter a message from an extraterrestrial intelligence?” A former astronaut that is reduced to nudging space junk into reentering Earth’s atmosphere discovers a message capsule sent from the depths of space. This is the Singularity moment that triggers all mankind to reexamine their place in the galaxy. We are introduced to a not-too-distant future where humanity has narrowly dodged both economic and ecological disaster and as a result has largely turned its head away from space. Tensions are raised as humanity determines how to respond to the message. I feel that this book does an excellent job of examining the nature of intelligence and how society handles the various ways that humanity can often overreaches itself. Brin gives us a diverse cast of characters allowing the reader the opportunity to explore the complicated future he builds. It seemed that at the heart of the novel was a warning about the potential paths that our society can go down. While it was hopeful that we will overcome the difficulties, the results are concerning when looked at from our present. 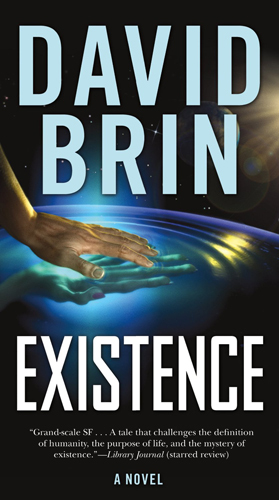 In some ways, I felt that this book was almost a precursor to Brin’s other works, such as his Uplift Saga, but it is definitely a book that can be read without reading anything else by the author.